Habit: Plants 1--30(55) cm. Stem: 1(7), generally forked distally, central axis dominant, +- gray to green, generally cobwebby. Leaf: generally oblanceolate, flexible, largest 10--15(20) mm, 2--3(4) mm wide; distal leaves 1--2(3) × heads, generally acute. 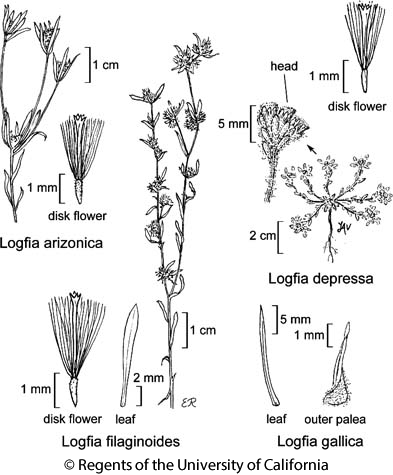 Inflorescence: heads (1)2--4 per group, at and between stem forks and tips, +- pear-shaped, largest 3.5--4.5 mm, 2.5--3 mm wide; phyllaries 0, or 1--4, unequal, like vestigial paleae; outer paleae in spiral ranks, curved inward 20--60°, longest 2.7--3.3 mm, body +- cartilaginous. Pistillate Flower: outer 7--13; inner (with pappus) 14--35. Disk Flower: 4--7; corolla 1.9--2.8 mm, lobes generally 4, +- bright red to purple. Fruit: outer 0.9--1 mm, +- straight; pappus bristles of inner 17--23+, 1.9--3 mm. Chromosomes: 2n=28. Ecology: Common, +- weedy. Bare, rocky, or grassy sites, drainages; Elevation: < 1800 m. Bioregional Distribution: CA-FP (uncommon NW, CaR), SNE, D (esp DMtns); Distribution Outside California: to southwestern Utah, western Texas, northwestern Mexico. Flowering Time: Feb--May Note: Dwarf plants like Logfia depressa except pappus bristles adherent, disk corollas 4-lobed. Citation for this treatment: James D. Morefield 2012, Logfia filaginoides, in Jepson Flora Project (eds.) Jepson eFlora, http://ucjeps.berkeley.edu/eflora/eflora_display.php?tid=81847, accessed on April 24, 2019. CA-FP (uncommon NW, CaR), SNE, D (esp DMtns); Markers link to CCH specimen records. Yellow markers indicate records that may provide evidence for eFlora range revision or may have georeferencing or identification issues. Purple markers indicate specimens collected from a garden, greenhouse, or other non-wild location.